The Chiefs couldn’t quite do enough to beat the Patriots on Sunday night, falling 43-40 for their first loss of the season to a New England team that suddenly looks like it has no worries in the world. Still, despite the loss, Kansas City has plenty to be proud of, and as the game came down to the wire, it was their ability to make big plays that helped make the night so much fun. Specifically, it was the Chiefs’ young quarterback who gave the game life, continuing his incredible hot streak and adding to his already lengthy highlight reel even in defeat. There is no better reason to watch an NFL game right now than Patrick Mahomes. 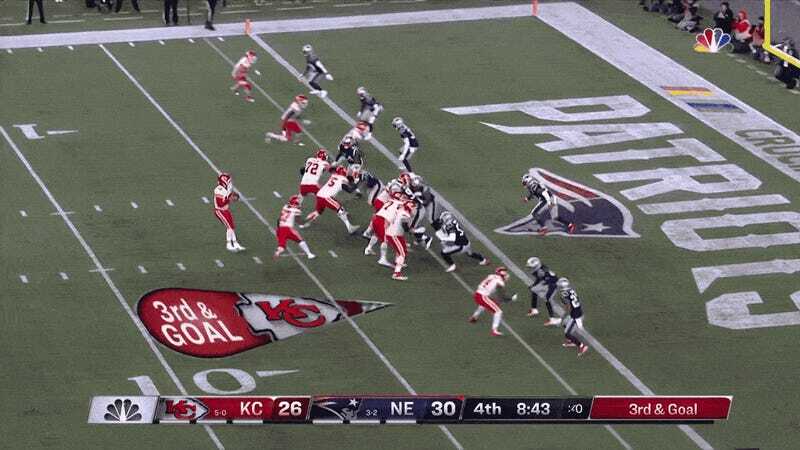 The play I keep coming back to is the one that gave the Chiefs a brief lead in the fourth quarter. It’s a far cry from some of the breathtaking deep throws and length-of-field plays that also permeated the game, but even on a seemingly mundane 1-yard TD, Mahomes does something neat. He appears to be throwing the ball to nowhere, or way out of reach of Kareem Hunt, when it leaves his hand. But really he just had the vision to flick the ball into a pocket of space Tyreek Hill could slide into and scoop up a score. It’s a cousin to that lefty pass against Denver, in that it’s weird and brilliant and requires the sort of fearlessness and improvisation you wouldn’t expect from a first-year starter. More simply, it’s just fun to look at, because nothing Mahomes does is un-fun. Mahomes did get off to an unsettled start on Sunday night, struggling to hit his receivers when the Chiefs were near the end zone, and tossing a pair of interceptions before the opening two quarters were done. 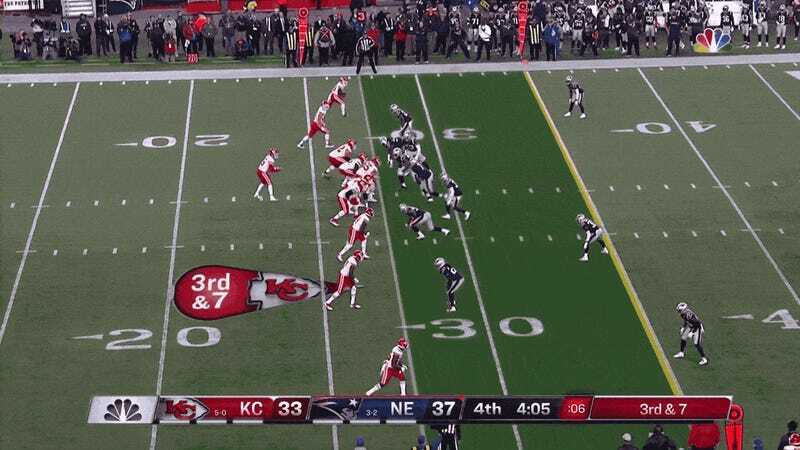 Tom Brady certainly outplayed him the entire first half, looking every bit the more experienced quarterback as he calmly sat in the pocket and executed the plays that have been winning games since Mahomes was six years old. Still, even though his team was down 24-9 heading back to the locker room, Mahomes showed at least flashes of his ability to make some ridiculously beautiful throws in desperate situations. His improv abilities are extremely sharp, and even though he plays a sport that’s heavily built around systematic conformity, it feels like Mahomes can stand out on every down. Thrillingly, Mahomes came out for the second half looking every bit like the man who made these kinds of special passes, and nothing like the guy who deflated his team’s hopes with an end zone interception at the end of the second quarter. On his first pass of the third, an off-balance Mahomes rolled out to his right under pressure, and with DT Adam Butler right in his face, found a wide open Kareem Hunt running straight down the field for the Chiefs’ first touchdown of the game. Thanks also to the explosive running ability of Hunt, Mahomes and the Chiefs worked to close the gap over the course of the third quarter. With a short field after a fumble, Mahomes hooked up with Tyreek Hill on a pretty corner end zone pass to cut the Patriots’ lead to 27-26. And following a massive kick return from Tremon Smith, the Chiefs earned a 33-30 advantage on that idiosyncratic loft to Hill. 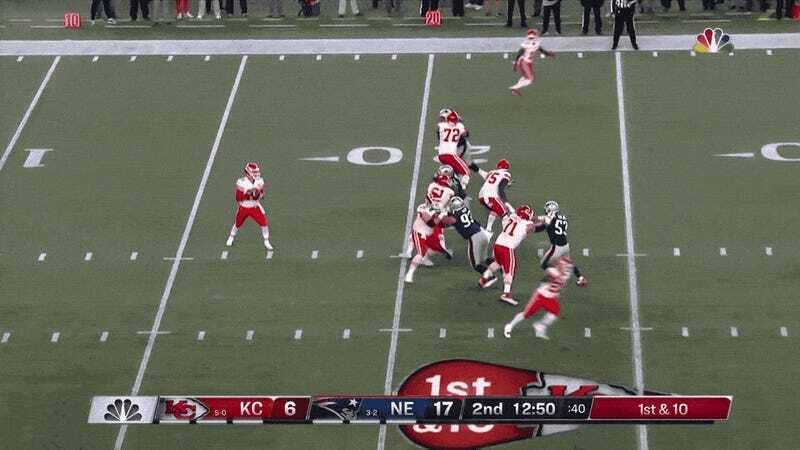 But Mahomes also had the confidence to make the play of the night, which had him stepping up in the pocket to just absolutely uncork a ball to Hill, who was all alone downfield and made a jumping catch that got the Chiefs their final score of the game with three minutes remaining. It wasn’t enough, but it’s what I’ll remember from this game. Brady was reliable and efficient as he led his team to victory, but Mahomes was a firecracker, improving upon his early, out-of-control mistakes to deliver multiple jaw-dropping plays in the second half. This is the most fun I’ve had watching an NFL player since Cam Newton’s MVP year. In both cases, a versatile, insanely talented QB seemingly pulls spectacular moments out of thin air, making sure you can never look away from even one second of their drives, because at any moment they can conjure up a legendary throw. 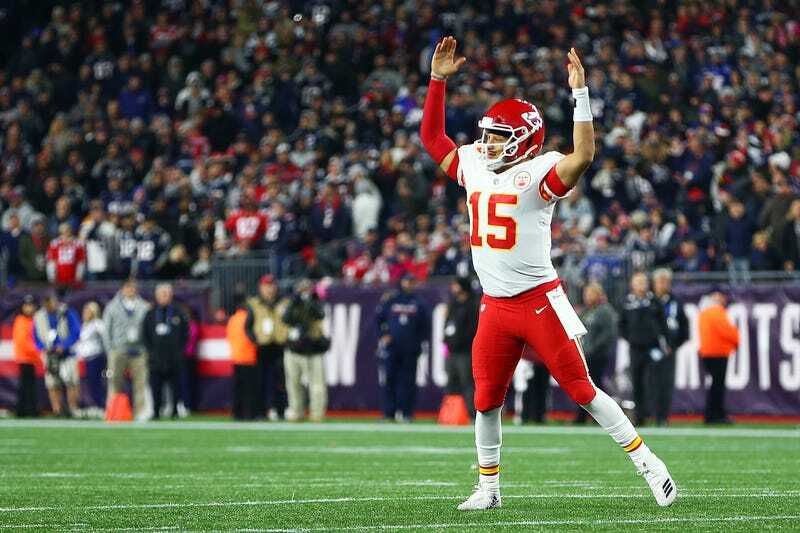 Mahomes may have lost the game, but if the Pats and Chiefs meet again in the playoffs, he’ll be the reason to tune in.